Rae Missigman is a self taught mixed media artist, who loves to create, blog and instruct. She has a passion for re-purposing found items and turning them into something beautiful. Her mission- to integrate up-cycled tidbits of everyday life into her art, has inspired her to approach creating in a whole new light, sending her on scavenger hunts of the largest kind in search of new materials.Rae has found a real love when it comes to combining paint, textiles, and paper- something that is evident in much of her art. 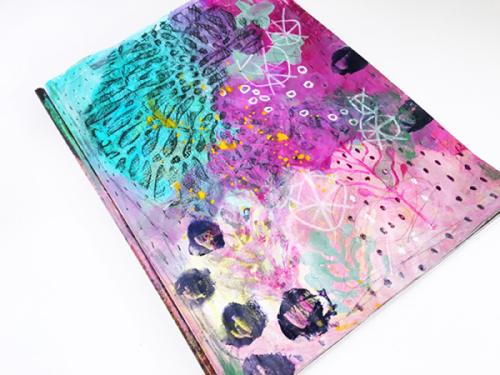 her She has a fondness for both pattern and color, which has led her to create outside the lines, resulting in artwork that is both busy and polychromatic.Rae enjoys making art in her Florida home based studio where she can balance both family and creating. Her work can be found on her website, at Stencil Girl Products and in boutiques across the Southeast. She has been published in numerous art based publications.